Would it surprise you to learn that the person in your team or company that regularly works 60 hours a week (and makes sure everyone knows it) is very likely the least productive person on the team? The person working 60 hours is likely the least productive person on the team. And I don’t simply mean that productivity diminishes after 40 hours, I mean absolute total productive output is less from someone working 60 hours compared to someone working less than 40. The reality is that you would actually get more done by NOT working that time than you will working those extra hours. This is a hard pill to swallow in a culture where ‘working hard’ is seen as a virtue, and the more hours I work the more virtuous I am. Long hours are often assumed to show commitment, dedication, loyalty. Maybe they do, but they don’t show productivity. If your company values those things above actual productivity then so be it, but understanding that it is about those attributes rather than productivity is a rather brutal fact to face. However, if you want to produce more and maintain high quality then you need to work less hours. I am likely to offend a few hardworking people with this but my assessment of the findings of these studies is that is is a subconscious manifestation of Parkinson’s law. “Work expands so as to fill the time available for its completion” If I expect to work 60 hours then I’ll make my work last 60 hours. Not just a European thing. Europeans have a reputation for favoring reduced working hours and I’m sure it is an ongoing frustration to those in America that despite typically working more hours, American companies are consistently similarly or less productive than their European or Japanese counterparts despite the longer working hours and less vacation. Interestingly, the study was actually a 12 year study by the Ford Motor Company of production in the USA. Before I go into the study in more detail I’d like to go back in time and talk about the history of working hours and in particular Henry Ford. If we go back 150 years there were campaigns all over the world to reduce the working week from 16 hour days, 6 days a week – 96 hours was considered a normal working week for many. Forward thinkers pushed for limiting the working day to 10 hours with breaks for food – a radical concept at the time. Over time much of this became law despite fierce objection from industry, and by 1914 a normal working week was 9 hour days, 6 days a week. The pressure until then mostly came from humanitarian motives and agendas, and perhaps because of that, businesses took steps to prevent it taking hold, reducing pay in line with reduced hours so a reduction of 20% of hours came with a reduction of 20% in wages, this undermined the whole movement. But then came Henry Ford. Ford created the 5 day working week, and a limit of 40 hours, but best of all he did it for profit and not for social good. At the time his factories worked 6 days and 9 hours a day (54 hours per week) just like everyone else, but he reduced working hours by 25% and instead of cutting wages he doubled them. As you can imagine his competition was not happy either, paying more for “less hours” was maddening, but what really made them mad was that productivity jumped up massively. People simply couldn’t get their heads around the idea that less hours increased overall productivity. Slowly the competition copied Ford and got the same results, productivity went up for less hours, and eventually this carried across to office workers too. But even with those starting results and seemingly unquestionable evidence we stubbornly cling to the notion that more work is more productive. I have written more about Henry Ford here. Last time the proposed reduction in hours was met with hostility but eventually it was seen as beneficial to everyone, especially the business owners that fought so hard against it. Once again studies show that reducing hours will increase overall productivity, and once again industry is pushing back on it in the face of the evidence. Challenging established culture with only facts is apparently not an easy battle. Studies repeatedly show that long hours (40+ hour) results in reduced productivity, reduced quality and a less healthy lifestyle, and yet society still perceives the number of hours worked as a measure of hard work. It is as if we see more value in the hours worked than the output of their labour. Someone that works 30 hours and produces 30 widgets is seen as less valuable than someone that works 60 hours and produces 25 widgets, because he works so much harder. In our culture we see more value in the hours worked than we do in the output of our labour. How did we get into such a mindset and how do we challenge that way of thinking. Surely we should reward the more productive and effective person? But we don’t, we reward the inefficient, we lift up Jane for being here at 7:30 PM finishing up his work and we criticize Anne who got all her work done and left at 4. Part of the problem, especially in knowledge work, is that productivity is not easy to measure, just like quality and mistakes are hard to quantify. So rather than focusing on what is important we focus on what is easiest to measure – number of hours in the office, it is ironic that in our laziness in finding effective measures we end up working longer hours. There is more bad news in the 12 year study by Ford they found that overtime (over 40 hours) results in reduced productivity in the long term. 40 hours is the very limit of maximum total productivity for a manual worker, this applies in both the short and long term. 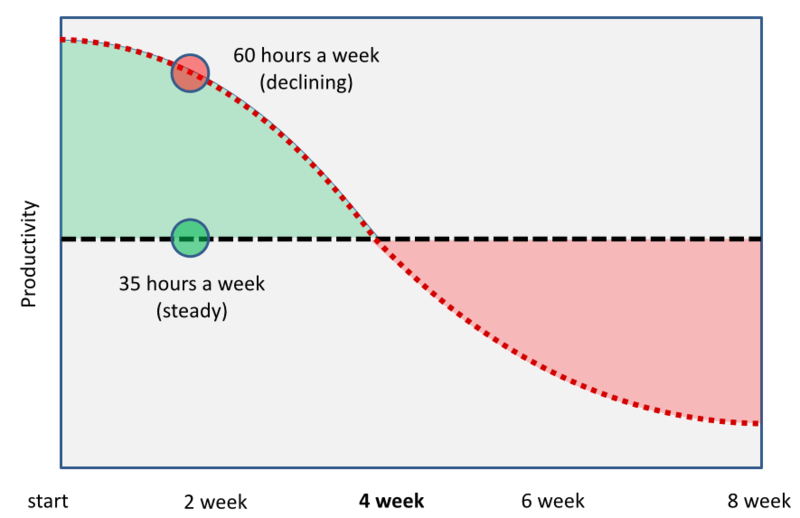 Short term (less than 3 weeks) there are productivity gains for working beyond 40 hours, but after 3 weeks those gains disappear and actually reduce productivity afterwards. 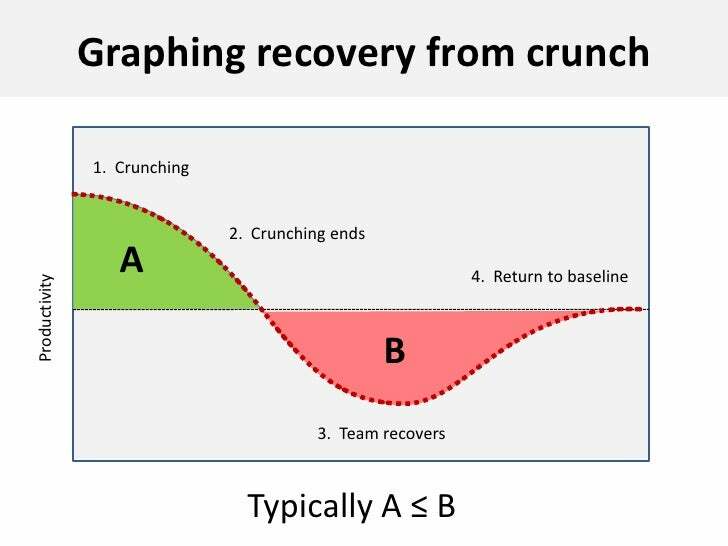 Even just 2 weeks of overtime and then stopping results in more loss in recovery than the gain made in the short term boost. In other words, yes you can make a short-term gain using overtime to meet a deadline, but it will cost you more than you gain over the following weeks. So use it wisely and expect a recovery period. For knowledge workers the news is worse still, the point of peak productivity is under 35 hours, and any hours above that are actually damaging, quality is markedly worse, mistakes and resulting corrections mean that productivity reduces dramatically when knowledge workers work beyond 35 hours, primarily because fatigue, stress and concentration have a profound impact on the quality rather than the quantity of work. We simply cannot be creative when tired, we struggle to solve problems come up with ideas or compose constructive discourse and debate, we are actually very likely making things worse not better and the clean up cost for knowledge work – bad decisions, introduced bugs, stifled creativity is far more damaging than not being there. Lawyers are typically in an unfortunately situation where they bill by the hour rather than by quality or even quantity of work. They are essentially encouraged by their business model to be unproductive (not consciously, it is just a product of the business model). Essentially a 60 hours week for them is the result of rewarding bad behavior, if you pay for time they take more time, pay for productivity and we become more productive. We also reward with status the hard working guy that is willing to sacrifice his weekend for the appearance of working harder. More encouragment of bad behavior. In ‘bill by the hour‘ work environments it is a challenge to change the model, productivity is hard to measure – even if we see stress, mistakes and problems taking longer to solve. So it is hard to convince clients that working less is more productive, especially when it means charging more, and it becomes even harder when we can’t even convince ourselves because this notion is so culturally ingrained in us. It is pretty simple really if you want to maximize the productivity of your teams, then reduce their maximum working hours to less than 35 hours (without reducing pay). They will work harder and more effectively for five 6-hours days than they will for 8 or 10-hour days. Your overall productivity will be higher. Or work 8-hours, 4-days a week and you will find your teams will be more focused, more energized and and noticeably more creative. They will be happier, harder working and make less mistakes. They WILL get more done and it will be higher quality and more creative. They will also be refreshed have a happier home life. Or we can ignore the brutal facts and continue to pretend that working long hours is a good thing, and praising the guy that works 60 hours a week and yet produces less than a part-time worker. Note: my wife finds this particularly amusing as I work long hours and when I’m not working I’m blogging and when I’m not blogging I’m working on my game or running meet ups – there is a significant degree of hypocrisy and self-denial at play here. Let’s not underestimate the difficulty here, this is a complex topic, and it is unlikely to be accepted any time soon, there is a lot of resistance – and that resistance is not based on a lack of facts or data. There are numerous studies on this topic, all with the same findings. Oddly enough despite the strong resistance to this idea, I couldn’t find a single study that didn’t find that overall productivity went down when hours went above 35-40 hours. There were even some studies that showed that regularly working 60 hours resulted in the same number of mistakes and level of performance as being drunk. Decision makers typically work longer hours and it is effectively their money, asking them to pay more for the perception of ‘less‘ work is never going to be an easy decision. We come from a puritan culture where we make a cultural assessment of someone based on effort not outcome. Deep-down we know this is not objective, I think we know this is wrong, but culture is not based in logic and changing culture will take more than facts and figures. It needs someone like Henry Ford to lead the way again. The irony is not lost on me that I’m reading this work-related article on a Saturday night…after working all day from my couch. Bravo, John, for reminding me to knock if off if I want to be more productive!